Puerto Rico is facing many difficult challenges that affect the quality of life of its people and threaten the future of the island. But, we trust that through partnerships and Friendship, we can all collaborate to provide a brighter future for the residents of the island. Walk with us and let's become the stepping stone needed to lift new tangible hopes for those in need. Through our Friendship, we will achieve extraordinary success in the areas of innovation and entrepreneurship to help foster economic development and create opportunities for growth in Puerto Rico. 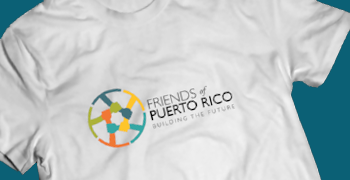 Friends of Puerto Rico is run by volunteers. We rely on generous individuals that help support our operations. To volunteer with rebuilding efforts in Puerto Rico, apply with Voluntary Organizations Active in Disaster or All Hands Volunteers. All funds raised will go towards our mission to Build Puerto Rico by investing in the arts, education and entrepreneurship.